The Luberon is the most beautiful area in Provence, stretching 34 miles on either side of a small, rocky mountain range, an hour or so north of the Mediterranean Sea. 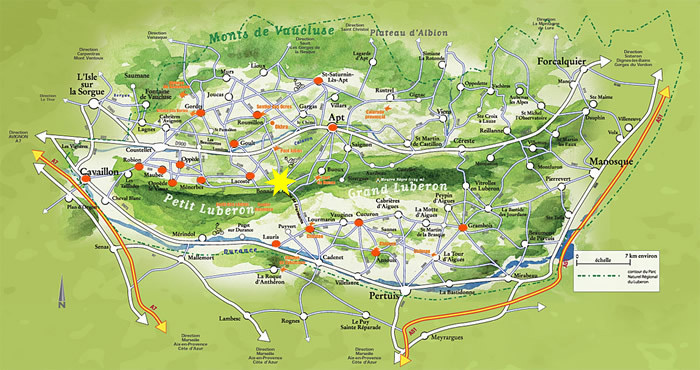 Bonnieux (marked on the map with the yellow star) is centrally located in the Luberon, on the north side of the Luberon mountain range, at the junction of the Petit Luberon and Grand Luberon mountains. It offers expansive views to the north: of the Luberon valley, the Monts de Vaucluse, and Mont Ventoux. The official history of Bonnieux dates back some 2000 years to Roman times when a major road, the Via Domitia, ran through the Luberon valley. The Romans built another road that headed up through what’s now Bonnieux to Marseille, crossing what was then a substantial river with a bridge. The 2000 year old bridge, the Pont Julien, still stands today and was used for daily traffic until 2005. It’s been beautifully-restored and is an excellent example of Roman bridge building. The early Bonnieux was called “Bitrona” and was located in the valley near the Roman bridge. In the 6th century the settlement moved up on the hillside for defensive purposes, locating in stone quarries. Fortifications were constructed in the 10th century, some of which still remain. The oldest part of the church at the top of the village dates to the 12th century and is believed to have been built by the Knights Templar. But the history of this area extends back much further. Many traces of prehistoric settlements have been found within just a few miles of Bonnieux. With an official population of about 1,400 people, Bonnieux is still a simple place in many ways. Farming (grapes, cherries, vegetables, lavender) is a major activity, carried out on small, privately-owned farms. Many residents are members of long-established families, living on properties that their ancestors farmed hundreds of years ago. Parents walk their young children to the school, waiting outside the gate at the end of the afternoon. People gather for coffee or a pastis in the local bars and play petanque (boules) at the village court. Senior citizens get together to share a meal and play cards. There’s a surprisingly good library and an active program of social activities year-round. And everyone finds their way to the local market on Friday morning, for shopping and to catch up with friends. The lifestyle in Bonnieux is typical of what goes on in small rural villages all over France. We absolutely love it. Bonnieux is an ideal base to enjoy village life in Provence. It’s small enough to be intimate, but large enough to offer important services, interesting shopping, and a variety of eating places. The two boulangeries are on either end of our street. The village also has an excellent small supermarket, newspaper shop, butcher shop, florist, pharmacy, post office, ATM, bike rental, and service station. There are several artist galleries and specialty shops… though only one shop (the village “presse”) where you can buy postcards. We count at least 10 restaurants open from Easter through October, some open year-round. There are also two wine bars. We like Bonnieux because it’s authentic… real… not just a tourist village. In the warmer months, the village attracts lots of cyclists, hikers, and independent travelers but very few tour buses. Our local shopkeepers, gallery owners, and restaurant owners will welcome you warmly. By the end of your week, they’ll know you at your favorite boulangerie or cafe and Bonnieux will feel like home. We’ve enjoyed Bonnieux and the Luberon every month of the year, and each season offers a different experience. Our apartment is available year-round. The beautiful summer months of June, July and August draw people to Provence. The sun is high, the colors are bright, and the days are warm (though not humid). Everyone wants to eat outdoors. There are many festivals, concerts, and special markets all over the region. Lavender blooms at lower elevations in early June and at higher elevations in late June and July. September brings the grape harvest, the “vendange.” Summer vacations are over, and school has started once again. Temperatures are pleasant– not hot. In October you’ll begin to see more autumn colors, continuing into November.The markets begin to quiet down as October progresses and some restaurants close. We love December and the Christmas season in the Luberon. Many villages have special Christmas markets and displays. Bonnieux is known for its elaborate Provençal crèche (nativity scene) in the old church at the top of the village. Some restaurants offer special truffle menus, and the boulangeries sell special cakes and breads. January, February and March are very much the off-season. It can be a good time to visit if you have realistic expectations and perhaps some indoor projects. Snow is rare. Cities and larger towns (like Avignon, Aix-en-Provence and Apt) are still busy, but the villages will be very quiet. Many restaurants are closed for a month or more or open only for lunch. We’ve often hiked in winter and early spring. When March arrives so does spring; the almond trees bloom, followed by the cherry trees in April. The Luberon valley comes back to life in spring, especially with the Easter weekend. Bonnieux hosts an annual pottery market on Easter Sunday and Monday, and the same weekend there’s a very big Antiques market in nearby L’Isle-sur-la-Sorgue. We enjoy spending time in the Luberon in the spring, and it’s an especially good time of year for hiking and cycling. May is a lovely month, highlighted by fields of poppies and other wildflowers. The days are longer and it’s usually warm enough to eat lunch outside– sometimes dinner too. Explore Bonnieux, especially the tiny streets at the top of the village, the oldest part of the village. Visit the specialty shops and galleries. Relax over a glass of wine or a coffee. Enjoy the colorful outdoor markets, including the Friday morning market in Bonnieux. We especially enjoy buying food to prepare back at home. There’s one nearby every day of the week. Our favorites include L’Isle-sur-la-Sorgue (Sunday), the farmers market at Coustellet (Sunday), Gordes (Tuesday), St. Saturnin (Tuesday), Bonnieux (Friday), Lourmarin (Friday), and Apt (Saturday). Learn more about the markets of Provence in Kathy’s two-part article. Hike in the countryside on the many marked walking trails, several of which leave right from the village. We have guidebooks and maps in the apartment. See Kathy’s article on Hiking in the Luberon for more information. One great hike is to the ruins of Fort de Buoux, not far from Bonnieux. Visit the Cedar Forest along the crest of the Petit Luberon mountain above Bonnieux, stopping along the road to admire spectacular views of the valley and Bonnieux far below. On a clear day you can see all the way to the French Alps. You can park in the forest where the road ends and stroll along gentle, flat paths. Tour the famous hillside garden La Louve, just down the hill from the pharmacy in Bonnieux. The privately-owned garden can only be visited on a scheduled visit; tours are conducted in French. Wander around the 2000-year old Pont Julien, the Roman bridge on the Calavon River below Bonnieux. 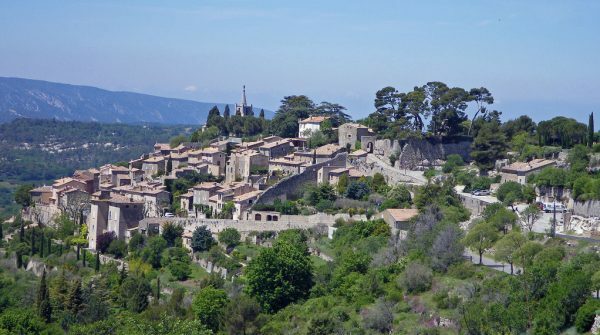 Visit small picturesque villages such as Lacoste, Roussillon, Gordes, Goult, Menerbes, Oppède-le-Vieux, Saignon, Saint-Saturnin-lès-Apt, Lourmarin, Cucuron and many more. Many of these villages are perched on hillsides and include chateau ruins you can explore. We also enjoy the historic town of Apt, the closest town to Bonnieux. Experience outstanding cuisine in a wide variety of eating places– from small cafes to Michelin-starred restaurants. Our housebook includes our input about the many options in Bonnieux. Buy food at the market and enjoy a picnic lunch in the countryside. We have a picnic cooler and ice blocks in the apartment for your use. Rent electric bikes or mountain bikes in Bonnieux to explore the area. Or kayak on the River Sorgue, beginning at Fontaine-la-Vaucluse. Enjoy fields of poppies (May) and lavender (late June and July) in the area around Bonnieux. Visit the famous Abbaye de Sénanque near Gordes and the isolated Abbaye St. Hilaire near Lacoste. Visit local wineries or the Bonnieux Cave Cooperative to taste and buy their wine. Lavender fields around Sault (1 hour). The lavender in this extensive area near Mont Ventoux usually blooms in late June and is harvested in late July /early August. The guidebook Provence Byways by Bob and Sue Winn is a great resource for exploring the area. We have copies in our apartment, but you can download a copy online to prepare for your trip in advance. We have an extensive collection of other guidebooks, maps and hiking books in our apartment for your use during your stay. By train: We’re located 45 minutes east of the Avignon TGV station, with high-speed train connections to Paris, Charles de Gaulle airport, and other major French cities. The Aix-en-Provence TGV station is further south from Avignon, a little over an hour from our apartment. Check schedules and buy tickets at www.trainline.eu. By air: The closest major airport is the Marseille Provence Airport (MRS), which offers flights to/from Paris, Amsterdam, and other major European cities. We’re a 1 hour 15 minutes drive from the Marseille airport. The Nice Airport is 2 hours 30 minutes away. If you’re considering coming to Bonnieux without a car, please talk to us. We can give you realistic information about what to expect and provide information about transportation options.